It all really started way back in 1994, with European Junior Championship Gold, continued via Bronze at senior level in 1997 and Commonwealth bronze in 1998. That’s when things started to get interesting, with victory in the NCAA championships in the USA and the first of his Commonwealth records heading into the Sydney Olympics. 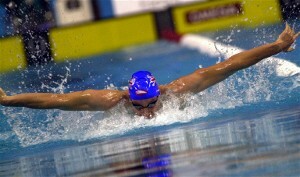 Steve was one of the few British swimmers at that meet to swim to his potential coming away with a creditable sixth place in the final of the 200m butterfly. 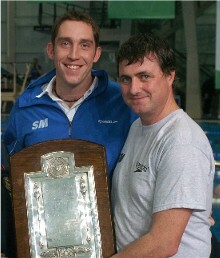 There followed a short hiatus as Steve adjusted to the Sweetenham regime; along with a number of other high profile swimmers he failed to make the 2001 world championships team, but bounced back in 2002, winning Commonwealth silver and his one senior international title at European Short Course level, holding off long time rival James Hickman in a classic final. Following those efforts, you voted him pullbuoy Swimmer of the Year for 2002, but the best was yet to come. A Commonwealth record and an agonising fourth place at the Barcelona World Championships set the scene for Steve’s finest moment in Athens last year as he stood on the Olympic medal podium and collected his bronze medal. It was an effort that prompted you to again vote for him in your droves and propel him to his second swimmer of the year accolade, but surely, being right at the top of his game, it must have been difficult to call time on such a successful career? We caught up with Steve to find out just that. Retirement. Was that a difficult decision to make? It was at first, initially thinking about it, but I think it was the right thing to do. It wasn’t the obvious thing to do, but I think it was the right thing to do. Too many sportsmen go on too long these days, largely because it’s just the lifestyle they’re used to, but my dream was to make it to the Olympic Games and get a medal and I’ve done that now. I’ve lost a large portion of the desire, not for swimming, and certainly competing at the highest level, but more so training. I was finding it hard to get up at 4:45 am to do the training and it just made sense to walk away from it now on a high when there are plenty of other opportunities out there for me. There wasn’t a part of you that wanted to keep going to Montreal or maybe even Melbourne? Oh without a doubt there definitely was a part of me that wanted to go on to Melbourne. Since I got silver in the Commonwealth Games in Manchester, there has been a big part of me that wanted to go over to Australia and beat the Aussies and the get the gold there; sort of a revenge type thing, but after weighing up all my options it just seemed like the right thing to do. There’s a few things really, I had an opportunity to go back to America and do some work with a property business I had started with a friend, but I still have a big passion for swimming and I want to share my philosophy with the grass roots level all over Great Britain. I’m going to channel a lot of my energies into that, certainly not through coaching, but more through books and maybe some DVD’s, that sort of stuff. I just want to engage the younger swimmers around the country in terms of what I think can make them great swimmers. I think we are great at training our bodies at the moment, but I’m not so sure we’re brilliant at training our minds and that is something I’d like to work on over the next three years. It won’t be a big money maker but it’s something I really do feel quite passionate about and I want to crack on with it. What kind of things will you be writing about? We’ve done the first book under my Mum’s name – “Mama Parry’s meals for little Olympians”, which is just about eating smartly, an obvious place to start, and the second one is going to be an essential guide for swimming parents and we’ll just take it from there. We haven’t started marketing them properly yet but when we do hopefully they’ll start going. You mentioned getting your philosophy across to the next generation – what’s the essence of that? Speaking of mental preparation and going back to Athens, you made a lot at the time about how you prepared yourself mentally between the heats and the semis. Was that something you knew how to do or something you were shown how to do? It was definitely something I’ve learned over the years. I mean you pick up little things here and there and think I was actually quite lucky in a way in the way I responded to the heat swim. Everything just fell right on the day, but I don’t want to leave that to chance for the little kids when they have the opportunity the biggest swim of their life or whatever, I want them to know how to respond to that kind of situation. I think I kind of stumbled on it, I can’t say that I exactly knew it, but if I can help anyone with that kind of approach in the future then fantastic. I’m not a psychologist but I am someone who’s been through it. After that morning swim in the heats, when you scraped into the semis in Athens, were you shocked, scared or worried? How were you feeling? I was more angry at myself really, and then it was weird. When I was swimming down this huge calm came over me and I just knew I wasn’t going to go out on a bad note and that I was going to turn things round in the evening. That’s when I set about watching Rocky III, Rocky IV, really motivational stuff, but more importantly visualising and not allowing any negative thoughts into my head. Everything had to positive from then on. Even now when I watch it back I’m always quite surprised at the change that came about from the morning to the evening. So having gone from disappointment after the heats to elation in the semi-final how did you then prepare for the final? It was weird again really; I kind of had the opportunity to go for gold or try and swim for the silver. 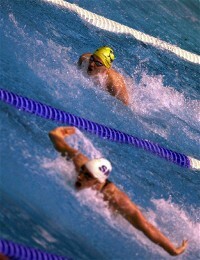 I knew I was obviously in good shape but I had to decide ‘Can I beat Phelps?’. Twenty four hours before the final, and for the first time in my life, I actually believed that I could beat Michael Phelps and that’s when I lay in bed and thought to myself “It’s the Olympic Games, a celebration of courage, I’m going to take it on and see where I truly finish”. Unfortunately it was a bronze as opposed to the silver that I think I was capable of but I was proud of the fact that I went for the gold, and more than likely got what I deserved. After Barcelona 2003, you were pretty disappointed when you came fourth, was that a big motivator for the year between Barcelona and Athens? I think it was really. I think it was quite opportune that I came fourth because I was right on the cusp and I knew that as long as I could beat one of those three guys I could get a medal. So rather than getting a medal and being in my comfort zone I think it probably spurred me on and gave me that little extra bit of hunger. Did you believe after Barcelona that you could still swim faster? Oh definitely. Sean Kelly is an amazing coach and we knew there was stuff we had to work on. We sat down and set a goal and we made some actions about how we were going to achieve that goal. We also sat down with the other swimmers at Stockport and said “Look we’ve got four chances of getting a medal here, more than likely not all of us are going to get one but we’re going to enjoy the journey”. I mean I’ve been though that journey before and not enjoyed it so much and then not enjoyed the results as well. That’s another thing I like to emphasise to the kids; you’ve be go to enjoy the journey, embrace the opportunities to have fun and you’ve got to be onside with your coach as well. When we sat down and did that I just knew that one of us, maybe two of us were going to get medals, James Goddard almost did, Graeme Smith and Adi Turner being the other two, but I know they took a lot of pride in me winning that medal just I would have done if they had won one and that definitely did spur us all on. When we spoke after you win in 2002, you’d just hooked up with Sean and since then you’ve swum your fastest times. How much of that do you think is down to Sean? I prefer to say that it’s down to the team, the people I was surrounded by. Obviously Sean, but also Julie at the club, Ben Lafferty another coach plus the other great Olympic swimmers I was surrounded by and the positive athletes that were invited into our group to train, precisely for that reason. We had fun all that time. Every session was fun; they were always hard but they were always fun. You’ve mentioned Bill Sweetenham’s drive and determination in other interviews you’ve done. Did that help get you over the line in Athens? The thing about Bill is that obviously it’s a tough regime, but I have no complaints about it. If I ever had any big issues with Bill I would take them to him and we’d talk about them, and sometimes he would think I was wrong and other times I’d think he was wrong, but I do actually rate him as a good leader and he provided me with opportunity to win a medal at the Olympic Games. Over the last four years we’ve also enjoyed some of the most consistent success in the pool. OK, so the Olympics might not have been as great as we wanted them to be but it was still a step forward from the previous four year cycle which must be good. What did you make of the world championship trials. There seemed to be a lot of negativity about them, but what was your take? I think that if you look back to 2001 there actually weren’t that many qualifiers for the worlds then. I didn’t qualify in 2001 and I think it’s generally up to the individual how they want to approach the meet. Yes it’s a tough qualifying standard, and people have said that maybe that’s not right, but I also think a number of people are focussing on the Commonwealth Games next year so you haven’t actually had some of the more senior swimmers qualify. Instead we’ve seen Kate Haywood come through, Caitlin McClatchey come through with flying colours, Kirsty Balfour has really come into her own for example. People step up at different times and I think some of the more senior swimmers aren’t prioritising this year and focussing on Melbourne. It is very, very interesting though, and it’s going to be more interesting to see, once the guys come back from America, if they can make those relay selection times which is obviously going to add to the number of swimmers on the team. What about your pet event the 200m butterfly; there are obviously a couple of guys starting to make a move to take over from you – are you confident in their ability to step up the next level? If you look at the medals that have been got over the years in the 200m fly it’s definitely been one of our better events. James Hickman is obviously responsible for a lot of those, and I actually don’t know how many it is since 1994, when James first won his Bronze at the Commonwealth Games, but but we’ve driven each other on for years and years to win those medals. I think those guys have got some big shoes to fill in terms of international medals but I’m very confident they can do it. I like to think James and I moved the event on, that we’ve raised the bar a little bit in terms of the standard that people have got to achieve, but they are very talented guys. Matt Edwards, Mark Lewis and Matt Bowe all went under 2 minutes, which people always struggle to do, in the last year, and I think they can definitely move things forward. It might take them a few years but I’m sure they will get there. Athens must be the defining moment of your career, what are the other highlights? I think people always think of highlights as some medal or something you can hang you hat on and of course being a European Champion, triple Commonwealth medallist and winning NCAA’s is all great, but, and it sounds cheesy, my highlight is the people I’ve been able to meet during my career. It’s been unbelievable. I’ve got friends in America, friends in Japan, friends in Australia, friends all over the world and experiences that have given me a discipline that I can hopefully take forward into the working world. I think I can guess, but what are you going to miss most from swimming? Easy one. Definitely the camaraderie, hanging out with the guys and the competitive edge at training but even more than that the sleeps in the afternoon. Finally, how would best want to be remembered as a swimmer? That’s a really tough one; Self examination’s really tough like that! I think as a good friend and a positive fella really. I always tried to get on with everybody and never really had a problem with anyone on the team and had a lot of fun. I don’t feel like I was the most talented swimmer on the Olympic team by any stretch of the imagination. I think I would probably slot myself in somewhere between 10th and 15th best, it just worked for me on the day and everything went my way. It would be nice to be known as someone who enjoyed the sport and the company of others and was a positive bloke. And one who won an Olympic medal!